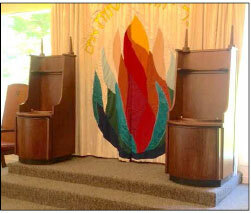 Our Shabbat services are uplifting and full of singing. Everyone is invited to join in our discussions, and to add their thoughts. The services are held every Saturday morning at 9:30 AM. They are usually led by our rabbi, with a lot of participation from congregants. Once a month we have lay-led services. Watch our calendar for the announcement of those dates. Most of the melodies we use in the service can be found at sidduraudio.com. Friday night services are held periodically and are often led by one of our members. They occur when we have special events like our annual Peter Ohring Foods by Dudes dinner (late January) or Shabbat Across America (early March) or at other times, at least once a month. Our High Holiday services are open to the public at no charge and full of festive singing and participatory readings. The new machzor, Lev Shalem, has become a favorite of our congregants who enjoy its English, Hebrew and transliterated prayers as well as poetry, inspirational stories and explanations.